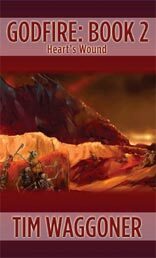 The Godfire duology concludes as Tarian Ambrus and his companions travel to the battlefield of Heart's Wound in a desperate race to save Athymar from the forces of darkness. 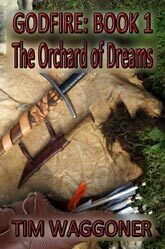 In Athymar, one of the Nine Known Lands, every man, woman, and child passes out at the same moment. When they wake up they soon discover that they are all imbued with godly powers, some minor, some major. Unknown to the land's inhabitants, the gods of Light and Darkness, Rudra and Anghrist and the human armies that sided with them, met on the ancient battlefield of Heart's Wound. The gods apparently destroyed each other and their powers were scattered amongst the human citizenry of Athymar. 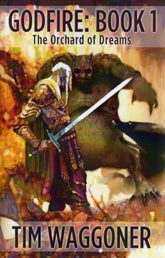 At the behest of the queen, a party is formed in the capital city of Pendara consisting of former warrior Tarian Ambrus, his son Phelan, the Esylken warrior Ashur Dal, the swordswoman Danya, and the wizard Cynric. The party is tasked with traveling to the battlefield of Heart's Wound in order to investigate what happened to cause such a dramatic change in the land and what, if anything, can be done to restore Athymar to normalcy.